Ana Mardoll's Ramblings: Author Interview: Charlie Cole on "Headhunters"
Ana: Today we have Charlie Cole introducing their novel, Headhunters. I haven't read this book myself, but Charlie was kind enough to agree to guest blog about their book to any readers who might be interested in the subject. Charlie, how would you describe your novel to your prospective readers? In broad terms, what is your novel about? Charlie: Thanks, Ana! Headhunters is a spy thriller about a man who recruits people into a privatized intelligence agency. He discovers a threat to homeland security that threatens his family and the country as a whole. Charlie: I wanted to explore the lengths that people will go to protect what's dear to them. In the case of our hero, Simon Parks, he makes choices to protect his family when he realizes they're in danger. With our villain, it's the things he will do in a post-9/11 world. Charlie: You can make money writing?? I had no idea. That's good to know! I've worked as a professional headhunter, recruiting talent for companies or government contractors for 15 years. It always interested me how closely that business was to the work done by intelligence agencies to recruit assets. In addition, I worked as a licensed private investigator, so that lends some interest to the genre. Charlie: I've been told by some readers that if Headhunters were made into a movie, they could see Bruce Willis cast as Simon Parks. That's not a bad choice. Some portions of the book read like Barry Eisler's thrillers. I do also have some adult scenes between my two leads and I've received favorable comments on those. Charlie: I've written a second novel called Damascus Road that was also a thriller and it still sits in rewrites. More importantly, I'm working on a book called Suicide Doors. It's a horror novel about three ghosts entangled in an ongoing string of murders. 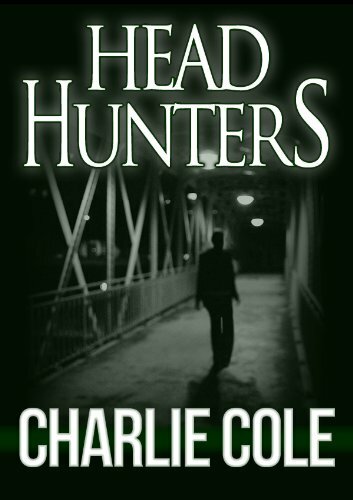 Charlie: Readers can find Headhunters for sale on Amazon's Kindle here, as well as a reading sample. They can contact me anytime on Twitter @CharlieCole or check out my author site and follow my blog. Ana: Thank you. Is there anything else you wish to add for our readers? Charlie: Well, thank you for the opportunity, Ana! I definitely would encourage readers to check out Headhunters now and keep an eye out for Suicide Doors coming in April 2012.